South and South-East Asia are natural habitats of Taxiphyllum ‘Flame’ moss. It grows in separate bushes in cool river water with slow flow. As a rule, it is considered that the moss grows horizontally in all directions and completely covers a surface with its bushes. It is true in most of the cases, however Flame moss in some way breaks deeply-rooted patterns as for how mosses grow: it grows vertically upwards and its shoots may become about 4-6 inches long. Though in a tank they usually don’t exceed 3 inches (8 cm). However, this moss grows widthway quite reluctantly. A distinctive feature of this aquatic flora representative, for sure, is its appearance: thick vertical shoots interlace and create a visual effect of a burning flame. However, this flame is a dark green one. The plant has undeveloped root system. This moss gets nutrients from water and soil due to its numerous rhizoids – extremely thin filamentary outgrowths which the plant uses to stick to a substrate. Strong water flow easily tears the moss bunches from the ground or other substrate (a snag, for example). All kinds of aquarium mosses are not demanding and Flame moss isn’t an exception in this case. That’s why it won’t be challenging to grow this moss even for beginners. However, the moss will become more bushy if you improve its tank conditions by using some special fertilizers and additional СО2 supply. 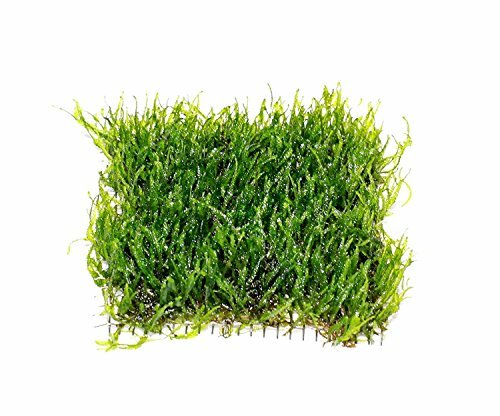 You can also grow this moss without СО2 supply if the tank water has low hardness and pH level. If рН level is high, then it’ll be enough to supply CO2 into the tank just to decrease рН level at least to 7.5 value. Small dosages of fertilizers will help you to improve Flame moss appearance, though they aren’t a must. The plant feels perfectly well provided with water temperature about 20-28 °С. The water acidity (рН) almost doesn’t play any important part, therefore рН levels from 6 to 7.5 will do for the moss. It can grow at low and medium illumination level; it is good for tanks both with and without CO2 supply. This moss is used to create middle distance and background decorations. It has low growth rate. Flame moss holds a specific place in aquascaping. It is often used to create images of forests, trees or just to draw attention to some specific elements of design in a tank. Flame Moss is in fact a perfect live ‘material’ in aquascaping. This not only due to its high decorative effect, but its plainness in care. Very often Flame moss is planted on stones or wooden elements of the aquascape. This allows to move the ‘flame’ bush from one place to another depending on the tank owner design. You can create an image of a bright green tree if you put a few bushes of the moss to a snag top. After reaching its maximum height, this ornamental moss stays in the same condition for quite a long time. If you need to create a decorative effect of a forest in a tank, Flame moss is the best option. This moss doesn’t stick to substrates very well, that’s why aquarists attach it to the substrate, otherwise it floats away. You can stick it to snags, for example, with the help of colorless sea-line or a light colored cotton thread; the latter will gradually dissolve in the tank water just till the moss rhizoids get attached to the substrate. To attach Flame Moss to the bottom horizontal surface a plastic net is used as a rule. You should place it flat on the area which you plan to decorate and carefully attach the moss bush to it by means of a transparent sea-line. Since Flame moss almost doesn’t grow widthway, you won’t have to thin it out for a long time and it doesn’t require any additional fertilization.